In October 2018, infective juveniles of Meloidogyne mali were isolated from a soil sample taken from the rhizosphere of elm trees (Ulmus sp.) located at one site in southern England. This surveillance work was carried out by the Plant Health and Seed Inspectorate following recommendations outlined in the EPPO pest risk analysis for the apple root-knot nematode, M. mali (EPPO, 2017). 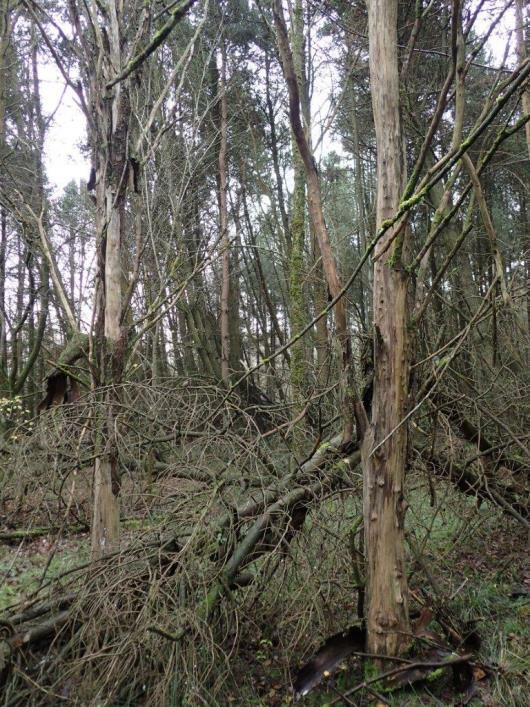 Statutory sampling at the location was carried out in December 2018, with M. mali populations observed infesting the roots of elm trees at this and one additional site (Fig. 1). Host roots exhibited the typical large galls, with small cavities, associated with this species (Fig. 2). A number of elm trees at each site have died, likely due to Dutch Elm Disease (DED); it is possible that nematode infestation could weaken the tree, making it more susceptible to infection by other pathogens. Morphological identification was done on formalin-fixed infective juveniles and perineal patterns of mature females dissected from root galls. Diagnosis was confirmed using molecular sequencing; DNA was extracted from 13 samples (Blood and Tissue Kit, Qiagen), and a COI gene fragment amplified and sequenced using primers JFB3-F (5'-TTTTTTGGGCATCCTGAGGTTTAT-3') (Bowles et al., 1992) and JB5-R (5 '-AGCACCTAAACTTAAAACATAATGAAAATG-3') (Derycke et al., 2005). All sequences (from two haplotypes) were deposited in GenBank (Accession Nos. MK520909- MK520921). Sequences were BLAST searched against the Q-Bank database (Bonants et al., 2013) and shared a 99-100% sequence identity to records of M. mali and to M. ulmi, a synonym of M. mali (Ahmed et al., 2013). No other species in the database had greater than 87% sequence identity (M. minor and others). The phylogenetic relationship of the samples relative to Q-Bank sequences is presented in Figure 3. Nematode specimens (infective juveniles, adult males and perineal patterns of mature females) were preserved in triethanolamine formalin, added to a 5% glycerol solution and incubated at 40°C to slowly evaporate the water and process nematodes into anhydrous glycerol before being slide mounted. Material has been deposited as voucher specimens in the UK National Collection of Plant-Parasitic Nematodes (NCPPN; accession numbers FNCV11006 - 10). This collection forms part of the European Nematode Collection (http://www.nce.nu). In the early 1980's, European countries received potentially infested elm trees via The Netherlands, to conduct trials on DED resistance (Heybroek, 1983). The imported trees were removed and destroyed at the end of the trial period, however this polyphagous species persisted, infesting other elm trees at the site. This is a new geographical record of M. mali confirmed from the UK. This nematode is an EPPO A2 listed pest, having recently been recorded in The Netherlands associated with uprooting of elm trees during periods of adverse weather conditions (EPPO, 2017). This root-knot nematode species has also been reported from Italy and France. Figure 1: Elm trees infested with Meloidogyne mali, southern England. Figure 2: Elm roots exhibiting typical large galls associated with Meloidogyne mali, southern England (scale in centimetres). 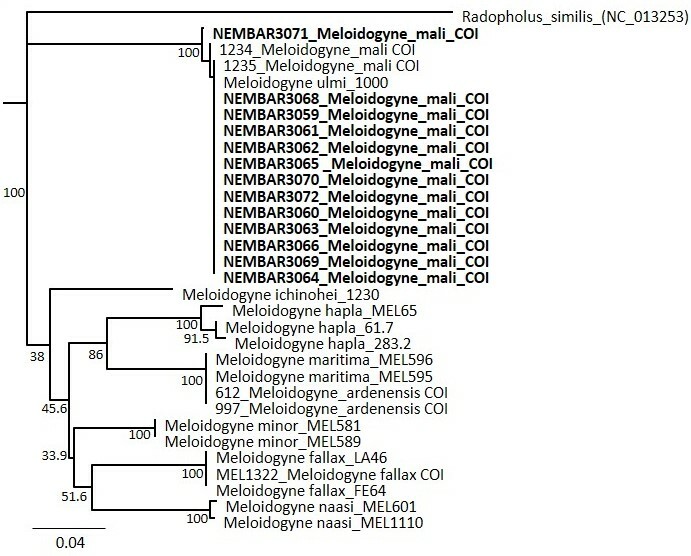 Figure 3: Phylogenetic tree of selected Meloidogyne partial COI sequences from Q-Bank and sequences generated in this study, truncated to a 393bp alignment. Tree generated in Geneious 10.2.3 (https://www.geneious.com) using neighbour-joining method, 1000 bootstrapped replicas. The authors would like to thank Rebecca McIlhiney for editorial review, and Chris Cunningham, Charlotte Davey, Amanda Dible, Maria del Mar Clemente Lujan, Joanna Maczko, Mark Oram and Paul Taylor for their assistance during statutory surveillance activities. EPPO, 2017. 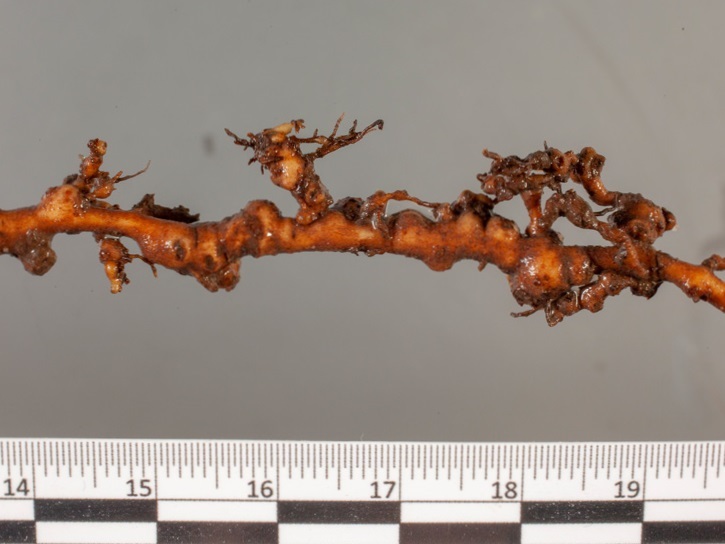 Pest risk analysis for Meloidogyne mali, apple root-knot nematode.https://gd.eppo.int/download/doc/1262_pra_exp_MELGMA.pdf (Accessed 5 March 2019). Heybroek H, 1983. Resistant elms for Europe. Forestry Commission Bulletin , 108-113.